1,2 and 3: Most of my gigs are with the Stones tribute show, so that means that my most used basses are the short scales. Of the shorties, the most used is the Gibson SG Reissue, because it is bulletproof, sounds perfect for the Stones tunes, and is light and easy to use as a weapon in dodgy pubs. The Duesenberg Starplayer is a fabulous instrument all round, and gets a run almost as often as the SG, but generally confined to nice cushy club and corporate gigs. The Ampeg Dan Armstrong reissue looks cool, plays really well, but sounds thin and weak, so only gets a gig where we're doing a special set that covers the Mick Taylor-era material only. 4. My next most frequent gig is the Doors show, and since I bought the paisley single coil Nash it is getting all those gigs these days. 5. My dakota red Nash P would be the next most used bass in the arsenal, it's a great all rounder. 6. Cataldo Fenderbird is my first choice most of the time for my original rock gigs with The Volts. 7. The Darkstar P is set up permanently a half step lower, for my gigs with Richard Madden, plus the Darkstar is the prefect pickup for a blues rock power trio. 8. Musicman Big Al. Not that I don't like it, on the contrary it is an absolutely brilliant bass, but other than sometimes getting a gig behind the Fenderbird, I'm not regularly playing in a band where it would be a visual fit. If I were playing a mixed cover band doing anything from the 60's to now, it would be my first choice, being such a versatile instrument though. Sometimes I'll take it along to a gig where we're doing an extra covers sets before or after the Stones show, as we do quite a bit at corporate and private gigs. 9. Tokai Hard Puncher. Again, a very nice P bass, but it's been relegated to backup duties since I bought the paisley Nash. It's definitely expendable, but it cost me less than $500, so it's a no brainer to keep it, given what a good bass it is. Update - the above list has changed a lot given many of those have left the stable, plus I'm mostly only doing fill-in gigs these days. I've only still got two of the basses mentioned, but have added a couple of others. 1. Fender Fullerton era American Vintage P (sunburst, flats) - I default to this because it fits in every band I fill in with. Whether I'm the white Darryl Jones in the Stones tribute, playing in the soul/funk/disco party band I fill in with, or the pub rock cover band I fill in with, it works perfectly in all those settings. Only a couple still around, I’m a shocker I know... and there have been quite a few in between as well. Knocked the 76 off. It’s a beaut and wears chromes for pick definition and plenty of booty. Still the same Fodera nickels but considering going pure nickel soon. Still loving the neck profile and satin finish. Finally got to replacing the string tree with something nicer. It’s the little things. Considering trying to wind my own pickups (with help I’m not mad) in the near future, depends how the Tele pickup winding goes. Picked up recently and feels and plays amazingly unsurprisingly. This gets all my home time as no bands it fits right now. Was converted to fretless at some point, hence why it’s so far down the list. Sounds great, unlike my fretless playing. Who am I kidding, my fretted playing could use some work too. Ok a lot of work. Finally got some extra parts I needed, but have been slowly fixing it up. Emphasis on the slowly. Couple things hanging around I’m fixing up or half heartedly trying to sell, so they don’t make the grade. Owned for two years, gets the most play at home as it's compact and already dinged up so I'm not so careful with it in cramped spaces, and rehearsal and gigs for my main band make it the number 1. The style is spot on 60s/britpop vibe, a little bit of palm muting and played with a pick nails the sound I need for the group. Currently has GHS brite flats for a not totally dead sound but rounds over the top end nicely. My baby, was getting most of the band time until I brought the Mustang to rehearsal. Very heavy being all mahogany unchambered body, but thick meaty dark tone for days makes it maybe worth it. Has a Nordy NP4a bringing the thunder, wide range pickup like a quarter pounder, quite hot for a P pickup. Wearing fodera nickels which make it right in the sweet spot for versatility, can roll the tone down for thump and bring it back up for grind/clarity as needed. Have been thinking about chambering and putting a new top on to bring the body weight down, but just sounds so good as is not sure I should mess with it. I tried changing the bridge to a $100 hipshot vintage with quick change slots and that lip hiding the ball ends? Not the same, back to the $20 wilkinson I went. Really excellent top notch playing and sounding 63 jazz without the price tag. Has versatile splittable neck coil to make it more P like. I was without a jazz for a while and really missed it, this with TIs on is very close to my ideal Jazz sound, possibly put chromes on it soon as my last J with chromes was the happy place. I bought as it was exactly the vintage J I was going to build, down to the finish and everything, so now I may not bother building one. Haven't put it down in the six months since maxgroover parted with it, reluctantly I'm guessing. Beautifully crafted, playing, and sounding bass. Very bright and clear for my usual tastes, but I have been running practice exercises on it to work on fretting technique and reading practice as it shows up all my bad technique and very clear note definition. I'm not wedded to it as I can't see it being useful for any gigs I do, hence why it was up for sale recently. I've only owned for a short time, under a year I think, so not attached to it. Mostly bought it as I missed the lovely ovangkol necks, I prefer over wenge necked Warwicks... blasphemy! Excellent flexible evolution of a stingray. Electronics took quite a bit to get used to, but now I have them it's fantastic. I wouldn't use half of the brighter tones, but with chromes it has such authority, and volume on tap if you need more. Ultimately I'm leaning towards the stingray sounds, but with a neck I can get along with. As such it's not a keeper for me, hence being up for sale recently, but a damn fine instrument all the same. I would probably swap this for a sterling or do a custom single humbucker build in future to get what I want exactly. Had it for a year and then some to get acquainted, haven't given it enough love, active basses generally put me off so I tend to pick up something simpler. Sunburst with la bella flats and rosewood board, being turned into a funk machine. Just need to install the covers and foam, then it should rise up the list a bit. For when I join my dream soul band... may never be #1 in that case. Picked up in the last few months making all my dreams come true. No matter how you frame it, a trad style P with Fender on the headstock is sometimes required. It's not being played as it's in bits and I'm fixing it up currently. Should get it going soon I hope. Full hollow body means it won't suit most of my gigs as it's liable to take off, but we shall just wait see... sorry Blaine I know you wanted to see this up and running, I will get there I promise. Hey guys, Don't post enough but I lurk a lot lol. I play my main three as my mood takes me. I am a bedroom warrior at these days but one day these basses will definitely see the stage again. 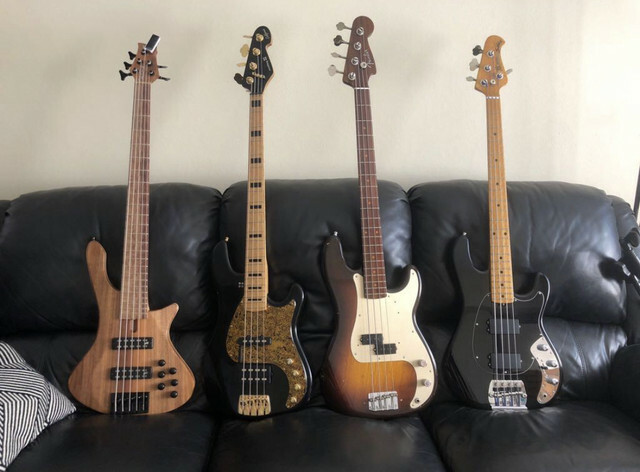 All basses have Prosteels that I order singly to make balanced sets. 1. Warwick Thumb NT6 from 94. Only owned for under a year but apart from significant weight is just the perfect fit for me. Truly incredible bass. 18v MEC 3 band pre and SD actives. Gets the most play for sure. If I choose the other ones this one always gets played aswell. 2. Spector Euro 5lx 2018. This bass is my newby and it is the looker lol. Backed up with serious sound and playability. Thumb basses are my sound and love but they don't fit everything. The Euro is much more versatile and conventional lol. A few days after unwrapping it I upgraded the pre to the EMG BQC control for the sweepable mid range that is too cool! This bass is called "The Black Cloud" as the matte black quilt is stunning. Absolutely no regrets. 3. 2015 Warwick Thumb Bass BO5. Funny that this bass is #3 as I would happily have it at number one for the rest of my life. I got this bass after having 5 years off playing where I had sold every bit of gear I owned (which was lots). Previous to buying it unseen I had played a Warwick $$ in a store for about 2 minutes. Got it for a steal and it has truly re-inspired my obsession with bass. It is a total growl monster. Very aggressive tone that is so much fun to pump. Factory Spec MEC pickups and 2 band. 4. Spector Legend 6 Classic. Got it mega mega cheap to see if I liked 6 strings. What really surprised me is the quality of this bass. Upgraded to BQC Control and EMG JAX pickups and it is a killer. Doesn't get much play with against the basses above but I have plans to make this my holiday bass and keep it down south so I am never without a bass. 5. Samick PJ 4. First bass. Will upgrade and mod one day but only bass I kept. I'm a sentimental fool. 1a - A custom Sandberg VS4 (P Bass) that I got from Stoneyboy. Its ridiculous and awesome and is easily my favorite. I never would've been the sort of bassist to use a "pre-aged" instrument but this thing is just too good to care how it looks :-). This one is the E Standard bass that I use for my funk/Soul band Safari Motel. 2 - Fender Crafted in Japan '57 Reissue P Bass with Gold Anodized plate, vintage style Hipshot bridge, EMG GZRs and a Hipshot Detuner. This one is set up for Eb Standard and gets dragged around to all my Eb Standard gigs but rarely gets used. It's a shame cos it's a frigging awesome bass! 3 - A Frankenfretless that I scored from the Music Swop Shop. It was very badly set up by whoever put it together but it was worth buying for parts alone. Allparts Ebony and Maple lined fretless neck, Seymour Duncan Basslines PJ Pickups and a Hipshot A Style bridge. It's my backup E Standard bass. 1a - A custom Sandberg VS4 (P Bass) that I got from Stoneyboy. Its ridiculous and awesome and is easily my favorite. I never would've been the sort of bassist to use a "pre-aged" instrument but this thing is just too good to care how it looks :-). Not sure how to name it's color, Is that the Iced Blue one ? Pictures please. Ah no! That's the one with the muiscman style pickup - a VM4 I think? The 63 Fiesta j is my fav bass,and use it or the 64j sburst when the venue looks “safe”.The 62 if it’s a classy gig.The 6O j cs journeyman did rehearsals and anything that looked “dodgy”.The “Rick” 1964 4001/1999 rarely gets used. Last edited by onehandclapping on 08 Nov 2018, 16:00, edited 1 time in total. Thank's for the pics FunkyJase. 1. Roscoe SKB+ MM+J, factory BEAD. 2. Sandberg Terrabass, factory BEAD. Equal split of use between them. 1. Curto short scale Warmoth PJ. 2. Squier P upgraded bridge, electronics, MickB PU. 3. Duesenberg starplayer Mike Campbell. Last. Epi TBird, Ibanez MC924DS, Framus 5/150. I don't play them much but I believe they should be preserved. PS Andy - I miss that Tokai P but I'm so pleased it's your #1! 1. Black Stingray 3-band 4H w Sadowsky Black Label Bright Nickels setup permanently for Eb. Used for pub covers and the blues band. 2. White Stingray 3-band 4H w Sadowsky Blue Label Nickels. I take this to any gig where I'm in standard tuning and don't really know what I might be playing. Also take it when filling in at the jam. 3. Duesenberg Starplayer w Duesenberg Rounds. Due to "incidents" I don't take this any more to gigs where we're playing at floor level. If I'm playing with the band that does 50's and 60's RnR I tend to take this. I tend to take this bass to the odd gig where appearances might matter more than usual (Sigh). 4. Mouse 30. Still for the rootsy "unplugged" gigs with the main band. I would STILL love to use this more often. NOTE: Recently acquired Fender Jagbird yet to be factored into the grand plan Still fiddling with myriad of sounds this thing is capable of. 1. Stingray 3band H w Chromes . Use it for the pub covers and blues band. 2. Duesenberg Starplayer w Chromes . Use it also for the pub covers and blues band. I take whichever of these basses jut appeals to me on the night as I go out the door. 3. Classic Stingray H w Daddario Nickel Rounds. Use this at jams, any gig where I'm not downtuned. I take this bass to any gig in concert pitch where I'm not sure what I might be playing. 5. Mouse 30. For kinda sorta rootsy "unplugged" gigs with the main band. I would love to use this more often. 6. Ashbory. Hate it. Never use it. Also its lost in the house somewhere. I remember that bass (I think I picked that up for you). Sounded so big and fat at the GTG. Have you played it at church yet? Does it feedback at high volumes?